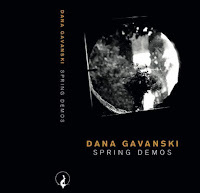 Dana Gavanski's debut release, a seven-track cassette or digital download, is released this week by Fox Food Records. It is as the title suggests a collection of demo recordings, but this just adds to the intimate feel of seven songs that are in the middle of their creation, raw, delicate and without the often suffocating presence of production. The fragility of the songs is evident from the start of opening track The Heart Inside, a tender almost-not-there guitar and a voice wracked with uncertainty and self-doubt with lines like "I've been trying to let it out and I think about it all the time, yet I found this heart inside" displaying a desire for laying emotions bare on the table with music and lyrics as its means of communication. That theme continues through the seven tracks on the EP, accompanied in parts by the most minimal yet effective contributions of bass, harp, bass clarinet and backing vocals. On The Wind (Blew You Away), Dana's plaintive acoustic guitar sets the tone for a song about a journey that starts in the dawn hours and continues through the rain as the backdrop to more confessional revelations such as "I thought I knew what to do, but when the hour came, the wind blew it away, the wind blew you away." The delving into her deepest thoughts and concerns continues on How Much Is Enough?, the title being the question Dana poses to herself in the chorus as she mulls over, voice on the point of cracking, her emotional responses to the world outside her and just how much of it she can take. The breakdown in the song is so intense that it feels like it's a pause for her to take breath and compose her thoughts before continuing. Where Spring Demos is at its most powerful is where the simplicity of the words Dana is singing sets the scene, tells the story and holds the listener's gaze without them realising. As Broken Seams starts with the line "woke to another cloudy day, rain drops tearing down my window pane, caught between words and dreams" it feels like we're being transported inside her head to share those innermost thoughts. "The snow is melting fast, is our love going to last?" is the question Dana poses in the first verse of How Long Has It Been? as her voice hangs in the air, adding to the poignancy of the words she's singing set to an eerie repetitive acoustic loop. It's at points uncomfortable listening for those not at ease with such an intimate invitation in to the deepest recesses of the performer's mind. There's hints of light in the guitars as Circles starts, but the sense of unease slowly takes over as the song progresses, talk of "even with my heart over it, each page I turn points to him, can't find the port so I must swim through the waves" suggests that the circles refer to thoughts going round in Dana's mind with no end. The EP finishes with Those Days, and compared to what's gone before it leaves us almost with a sense of cautious optimism through a coming to terms with the fact that "only time could tell us what was real, what was real, what we could feel" and that however much analysis of situations is undertaken "nothing can change those days, but I don't mind." Spring Demos is an astonishing collection of songs that feel like sketches of their creator's deepest and darkest thoughts laid bare for all to see and hear. Adding production and fleshing the songs out would somehow distract from the impact that they have. It's far from an easy listen, but then the very best music often isn't. It will make some realise that their own thoughts are not so strange or uncommon, but hearing it put to music hopefully will help as a catharsis. It might not feel complete, but it's perfect just as it is.